Provide your clients with a way to trace their shipment online. Simply enter the consignment or shipment number and trace the shipment with the current status. The user can trace the shipment from shipment number. In the Courier management software, the user can see all the items according to his shipment. Like source, destination, etc. with shipment current status. Additionally, they can see the signature of the parcel recipient person. On the Courier Software shipment tracking page, the user will not only see the details but also print all those details on a paper by click print button. Including this online tracking feature, you will get your individual complete website which has all the static pages like home, about us, services, price list, branches and contacts us. From Courier management ERP system admin panel, you can add new shipment. You can choose your existing consumer and just fill the other information regarding to the shipment. Here you`ll found all of your shipment with its current status. You will update your shipment status from here. From Courier management software admin panel, you can refresh the shipment status. The user can update the shipment by delivered to and if don’t deliver then the reason for that. Here you can also mansion delivered date, parcel receiver person signature copy, the courier delivery person with his mobile number. At the report page, you can find all your delivered shipment. The user will edit its status from delivered to undelivered. Courier Software included add branch option in our courier tracing software. So, for joining a new branch you just require to add the details for that branch in your admin panel. The courier tracking feature includes the exciting customer feature. Wherever you can add new exciting customers, edit their information’s. These existing customers will explain on your add shipment page. In Courier management ERP system the user will just require to select your customer or company name and all the information of the customer will be filled automatically into the areas. The admin panel, you will find an option to add an excel file for bulk upload new consignments. Adding consignments is the simplest way. Thou you will see also the history of consignments. With courier management software, boxes can be traced in real-time as well as their delivery path, exact positions and drop off data. The client can obtain the customer web portal to obtain their information. This feature allows clients the comfort of obtaining requests, registering their exact positions and control the status of their orders outwardly having to make immediate contact with the distribution companies within the Mobile app for Courier Industry. This tool recognizes potential routes through reducing challenges in distinguishing areas where plans would be more efficient for industry growth and development. Effective time management is executed possibly by suitable route classification. With specific algorithms, offerings are made in the least number of times by covering driver accessibility, goal approach and traffic contingencies by GPS tracking. This module makes the work of couriers and managers easier by altering the reporting module to suit their specifications. Users were conditioned to extract only relevant data to save them the stress of having to sift through a combination of both relevant and irrelevant information. Courier software features an online program for dispatchers which incorporate their different pickups and stops for each day. Consumers are notified individually time there is a difference in the situation of the package. While there is a demand for one carrier service provider to employ the assistance of another, their particular management software brings out the discussions involved. Courier management ERP system computes all performances under a particular time interim and makes an invoice instantly. Original invoices are also conveyed to clients. With this peculiarity, data can be carried from and shipping to excel on the go. The pressure of having to receive data from the scratch is being excluded by this feature. Consumer and company data are safely saved in the cloud and can be recovered whenever the need appears. This guarantees associated data is not lost yet when a system breakdown happens in the company. Including the use of Courier management software (specifically route optimization/heat mapping), cases get to consumers faster and in a further efficient manner. Even if there is a late order, it can be conveniently added and released in time. Destruction of Tedious Paperwork with Computerized invoices, carrier waybills, proof of delivery and todo spreadsheets reduce cumbersome paperwork which in change reduces error in records, paper storage location and time needed to send delivery confirmations. Available for Company and Client Online Courier software offers delivery manner management less troublesome for dispatchers and clients. Dispatchers have straight and simple guidance to deliver packages and customers can easily control their packages and recognize correctly when they receive it. Courier management ERP system is provided with portals and applications that can be used by customers to access specific services outwardly having to make direct contact with company agents. This modification in call rate is useful to efficient administration and consumer satisfaction as the consumer has the independence to serve himself whenever they want. Enhanced Communication Inside Company Management, workers, and customers of a carrier service. Enjoy the advantage of continuous communication and access to important and up-to-date knowledge on deliveries. Messaging and intelligence keep operators and carriers in direct contact with one another in the Mobile app for Courier Industry. Real-Time Discernibility on Deliveries. The effective transportation process is performed because the client and company can control the status of a package. Manageable and Straightforward for Couriers, Dispatchers can quickly enter and manage positions as necessary within an unambiguous process. The Citta Solutions is a professional-grade hosted Courier management software solution that meets the end-to-end needs of your transportation business. If you are a carrier, freight broker, messenger, courier or dispatching service you can be more effective and save money with the Courier delivery software. we are having huge experience in courier and cargo software development field since 2009.We have successfully developed various types of Courier management ERP system. We are basically from Ahmedabad India but we provide our online services to all over India. ● Customize billing, rates, and assistance to suit consumers’ specific needs. ● Customer Management also combines contract billing, sales tracing, electronic notifications, invoicing and a built-in collections tool. ● Courier can customize the information they want to see on their screen. ● Allows courier to know wherever drivers, details of packages they have and which driver is best suited for the next job. ● Warns courier if a shipment is “almost late” or late. ● Courier can trace the real-time GPS location of their drivers. ● Manageable, powerful and user-friendly pricing. ● Price using position, position-weight, position-count or door-to-door distance. ● The unlimited number of overcharges can also be automated. ● Build custom price charts for any customers. ● Build customer invoices and driver arrangements in minutes. ● Comprehensive audit trail and notes. ● Trace balances, current and past-due accounts receivables. ● Accommodates a variety of administration records including offering analysis, revenue and A/R. ● In extension, you can customize your reports with Courier management software. ● Clients can enter and track their orders online and receive real-time notifications via email or SMS of completed deliveries. ● Onetime an order is placed your client can log in to track real-time status and proof of delivery including an image of the signature collected at delivery. Citta Solutions have developed Courier Software that executes packet distribution to Couriers company and maintains excellent reporting, billing and control over Courier company and therefore provides a clear report to management “how the courier company are doing their assigned job”. Making a different tracking no. (Docket No.) for each parcel received. Defining the client/customer who has contracted this packet for delivering (i.e. whether one-time customer/regular client). Recording the knowledge about the location where the packet is to be delivered. The rates as determined with that client for the earlier criteria. ➢ The location in which they deliver packets. ➢ Aspects of the person who obtained with the address [self-Delivery], contact information etc. ➢ In case of non-delivery of the package, the deductions for the same. ➢ Date and time of package performance (or an effort for the same). ➢ Developing the bill’s statement. Depending on the prices, corresponding packet weights and their target areas. the notes invoice is provided for that client for all the packages collected during that month. ➢ Print of the bills invoices to be given over to that client for payment. ➢ Amendments to the bills invoice – this section allows the administration to correct the inaccurate one. Today, the on-demand delivery culture is driving businesses to adopt different strategies when it comes to their operations. After all, in the tech world, everybody wants to work faster, smarter and more efficiently. This is why many companies choose to redesign the way they operate on a daily basis, cutting extra steps from their workflows to give better results to clients. Today, on-demand delivery software solutions are placed at the center of this culture. This creates a strong relationship between customers, deliverers and businesses on a real-time basis, facilitating faster deliveries, improved operational management and enhanced customer satisfaction. To change how businesses, operate today, there are a series of solutions that allow companies to streamline operations, keep better tabs on merchandise and track where your spending is going. But with features like route optimization, real time alerts, access to analytics and data that help speed up the process, as well as live tracking of the delivery and importing spreadsheets with just a few clicks, you can rest assured that your speed and productivity will increase considerably. From increasing efficiency in the way, you deliver items to being able to determine the most optimal route for your upcoming delivery, Courier365cloud uncovers the top 5 benefits of using a delivery management software. Going completely digital means saying goodbye to stacks of paperwork. Although many logistics companies and drivers in the business are still resistant to tech, times are changing fast and anyone who wants to work more efficiently will need to integrate new technology in the way they work. The advantages? Your daily operations don’t have to be manual anymore; after all, to succeed, integrating a delivery management software into your operations is absolutely detrimental into how you want to compete in the current e-commerce market. Think more visibility into daily delivery operations for your team, electronic proof-of-delivery and e-signing as well as having complete control of daily tasks. Most of the times, inefficient routes are the cause of badly managed time hence avoidable delays for the customer. With accurate algorithms which ensure that drivers complete most deliveries in the least amount of time, you will be able to create a truly advanced end-to-end delivery platform, reducing fulfillment costs whilst delivering a top-notch experience. By measuring driver availability, location proximity and delivery traffic conditions, you can optimize the routes for your drivers and create a smart and efficient delivery route. 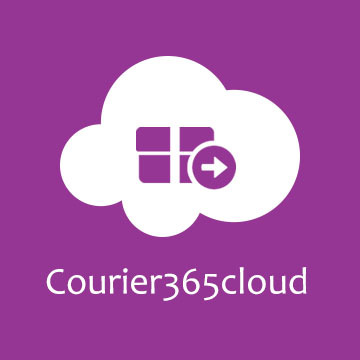 For instance, Courier365cloud has integrated Google Maps API in both the admin panel and driver app, which means you can track the location of your drivers. The dashboard also has features to automatically record delivery time, distance, pick-up and drop-off location. Around ten years ago, being able to track and trace goods in real-time was a prospect for the future. But today, with the aid of modern technology, businesses and consumers have unprecedented real-time visibility into the status of their order. This translates into businesses adapting to consumers’ needs, not only by delivering fast but also by delighting customers along the way. In order to be successful in this competitive industry, more companies choose to build an infrastructure which will help streamline operations. By having access to real-time information, companies will find it easier to prevent and fix inefficient processes on-the-go. Constantly keeping the customer in the loop with notifications throughout the delivery process ensures a professional and satisfactory experience for both parties. Also, notifications which are available in transit and on delivery of their order ensure that the customer is available at the time and place of delivery hence allowing the delivery process to be smooth. By having direct access to data recorded from the orders and drivers, your company will have insight into the delivery operational flow. By keeping track of your data, not only can you monitor your entire fleet smoothly, but also check the driver performance, so you know how to better manage them in the future. This is an important feature as you can gather information on your customers and customize your services based on their requirements.